Starved of food, North Korea is on the brink of collapse, and in its desperation threatens an invasion of its South Korean neighbours. Reports from the country reveal Kim Jong-un has built a replica of the South Korean presidential palace to train his troops for an invasion as tensions escalate. And with America pledged to defend the South in case of attack, the West faces a war that will cost $100billion to fight and cause $1trillion worth of damage. Former Whitehouse adviser Victor Cha described how a North Korean invasion would play out in his book, The Impossible State. Special forces would invade first in a series of predawn airdrops and shore landings, sabotaging power stations, communication networks and bridges in order to “paralyse the population”. Then “the largest artillery force in the world” would pound the South Korean capital Seoul with shells at a rate of 500,000 per hour — leaving its people only 45 seconds to take cover. An arsenal of 600 chemically-armed missiles would cripple airports, making escape impossible, while 100 more trained on Japan would slow the arrival of US reinforcements. Any forces that do attempt to cross the Tsushima Strait into the South face waters infested with Kim’s submarines, all of them told to torpedo American supply ships. In the meantime 700,000 North Korean troops and 2,000 tanks would pour across the border, with invasion tunnels discovered as deep as 475ft down — some capable of shifting 30,000 fighters an hour. With millions fleeing, the road networks would be impassable, leaving defensive forces helpless as the enemy races across the 50 miles between the border and the capital. And the battlefield would be polluted with up to 5,000 metric tons of chemical agents, including nerve gas, mustard gas, choking and vomiting agents, and perhaps even weaponised diseases. 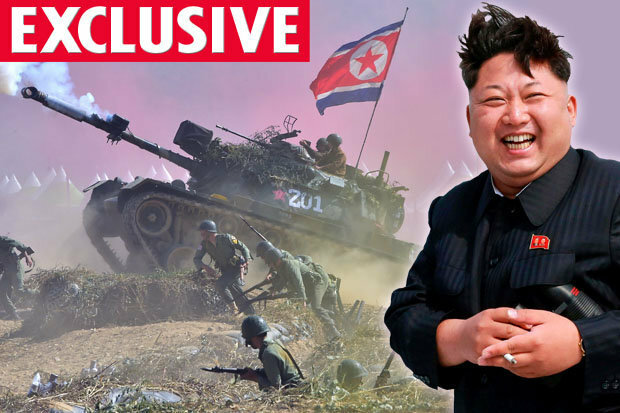 It would take South Korea and its American allies several days to neutralise the enemy artillery, his book reveals, leaving hundreds of thousands dead. Ultimately superior technology means the US and South Korea would win, “but not without four to six months of high-intensity combat and many dead,” says Mr Cha. He continues: “The obsolescence of DPRK equipment and training does not mean they are rendered harmless. And Kim’s defences mean invading the North is a fool’s errand, with the Pentagon predicting hundreds of thousands dead as the best case scenario. Fearing an invasion, the repressive regime has left only one paved road between Pyongyang and the border — easily targeted by the North’s bombers. Its special forces can march 31miles a day with an 88lb pack and are trained in “all aspects of infiltration and covert operations, even the use of kitchen utensils, as weapons”. Kim’s dad kept 1,000 of the very best as his personal guard, no two of them related, in order to ensure their first loyalty was to the leader. Command centres, factories and food and fuel depots with six months of supplies are also buried beyond the reach of American bombers. While beneath Kim Il-sung square, in the heart of Pyongyang, a bunker command post with fresh water, ventilation and a secret escape tunnel is believed to have room for 100,000 men. So far the sheer cost to both sides has kept the peace, says Mr Cha, but with the regime becoming increasingly unpredictable, it’s unclear how long the balance will last. The ex-Whitehouse adviser continued: “There are other dynamics, short of an all-out war on the Korean Peninsula, that are equally dangerous.